Our premium quality anaesthesia products include Corrugated Breathing Tubes, highly in demand in various countries. 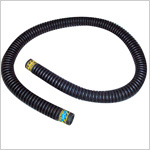 The GPC Corrugated Breathing Tubes are made from flexible black rubber, using forming & extrusion processes. They are applied for connecting different components in a set up for administering oxygen to a patient. They ensure a continuous flow of oxygen. Corrugated Tubes are produced by us in various sizes. Send Your Buy Requirement For "Breathing Tubes" AND Get Quote Quickly.